Thousands of people rallied in Taiwan to support students who have been occupying parliament for three days. They waved banners and shouted slogans to denounce a trade agreement they fear will make the island vulnerable to pressure from China. 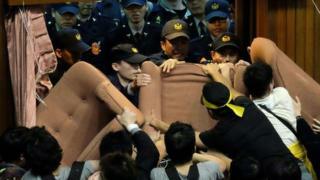 Hundreds of young people invaded parliament's main debating chamber on Tuesday evening and have barricaded the entrance with furniture. The government called for consensus but rejected early talks. The police have set up barbed wire barricades and deployed thousands of officers in and around the parliament building. They failed to breach barricades made from armchairs when they tried to enter the main chamber. Some of the protesters held aloft sunflowers as a symbol of hope as they rallied outside the building. They oppose the ratification of a trade pact with China which will open service industries to investment from both sides of the Taiwan straits. The protesters fear that Taiwan is becoming too economically dependent on China, which regards the island as a breakaway province and is pledged to eventual reunification. President Ma and the ruling Kuomintang (KMT) have pursued closer trade and political links with Beijing and say the trade pact will boost the economy and provide jobs for young people. He called for a peaceful end to the confrontation and said the dispute should be resolved in a rational way. The opposition Democratic Progressive Party (DPP) has pledged support for the students while they remain inside the parliament building. The party does not have enough votes to block ratification. It says that it opposes the methods that are being used to secure ratification. There has been no official comment from China, but the Communist Party's Global Times newspaper, said the protest had shamed Taiwan's democracy. There was also much comment on Chinese social networking sites. Many contributors expressed disapproval at the scenes of protest and chaos.